The iPhone 5S may have a fancy new dual-LED flash, but ultimately, it doesn't make that much difference. Low-light pictures continue to the bane of the phone photographer's existence, and every blurry, noisy, and/or blown-out shot from a dimly lit bar is a painful reminder. This new case from Brick and Pixel called the Lightstrap might just change that. 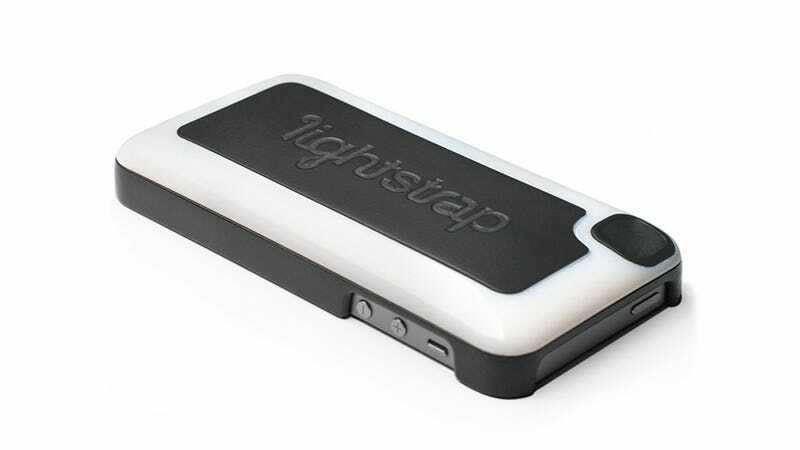 Lightstrap is, essentially, a flash-boosting case for the iPhone 5 and 5S. Not only is Lightstrap 10 times brighter than the flash on the iPhone 5S, it is a nicely diffused array of LED lights. Essentially, it acts as a ring flash—a staple of fashion photography—for your phone. The genius part is that you don't have to do anything extra to trigger it; Lightstrap senses when your phone's flash lights up and instantly follows suit. That means you can use it with any photo app, as long as it can use the flash. It has its own, built-in 1000mAh battery, so it doesn't steal any juice from your phone, either. It promises 500+ flashes or 30 minutes of video lighting and months of standby time on a single charge. Oh, and the video light is roughly 30 times brighter than the iPhone's. Because its light comes from LEDs, that makes it extremely customizable, too. You can choose from six different color temperatures and seven levels of brightness to best match the ambient lighting. No, it can't automatically match color like the iPhone 5S's True Tone flash, but frankly, the 5S doesn't do a very good job with that anyway. There are two buttons on the Lightstrap, which allow you to cycle through the color temp and brightness settings, and we found it very intuitive to use. For all that, it's a relatively sleek case. At 16mm it will make your phone just over half an inch thick and it will add 2.5 ounces to it. It's nicely tapered at the edges, though, so it doesn't feel very bulky. It's about the same thickness as a high-protection case, ultimately, and it's probably something you'd just leave on all the time. So, obviously, the company is making some pretty bold claims, but Brick and Pixel sent us an early prototype of the Lightstrap and we were extremely impressed with the results. Because there's just so much more light to brighten up the scenes, the iPhone switches to a higher shutter speed and a lower ISO. That means much less blur and much less noise. The light is more evenly spread, too, which helped reduce places that were blown out next to places that were lost in shadow. The improvement in skin tone is probably the most dramatic difference, as you can see above. We also found that the auto-sensing of the flash worked every time, which is mission-critical. The case was comfortable to hold, and it didn't feel overly bulky in the pocket (though it's certainly fatter than the very slim iPhone 5/5S). I did find myself accidentally blocking part of the LED array with my fingertips at first, but that's just because I'm used to taking pictures with my fingers wrapped around the phone a little. You'll quickly adjust the way you hold it and won't even think about it after a few days. The one quibble is that occasionally the photos turned out a bit darker than we expected. Brick and Pixel is aware of the issue, though, and says they already corrected most of it with a firmware update. Clawson also told us, "...because Lightstrap produces so much more light than the iPhone flash, it is much more important to use a finger press or focus/exposure lock to tell the camera what the focus of the scene is. That way the camera will meter for your subject as opposed to metering for the overall scene or background. This will produce the best outcomes most of the time." The other major caveat is that Lightstrap is a Kickstarter project that just launched today, so it comes with our usual caveats and grain-of-salt prescriptions. It's a lot easier to make a prototype than it is to bring that prototype to production. That said, after speaking at length with Cassidy Clawson, Brick and Pixel's co-founder, we feel very confident in their ability to deliver. The company (a father/son team, which awww...) has a solid history of producing medical and biotech devices, and the manufacturing plan is well laid out. Obviously, Kickstarter is always a gamble, but this seems like a pretty good one. We made the difficult decision to pull our Kickstarter campaign to pursue other methods of launching the device with a higher probability of success. We are deeply invested in this product (personally and financially) and we are committed to bringing Lightstrap to market successfully. This is a complicated business and we're doing our best to take care of the product, our team and our potential customers down the road. We'll share updates as soon as we have them. Bummer. Hope this just means we'll be seeing it come to market sooner rather than later.